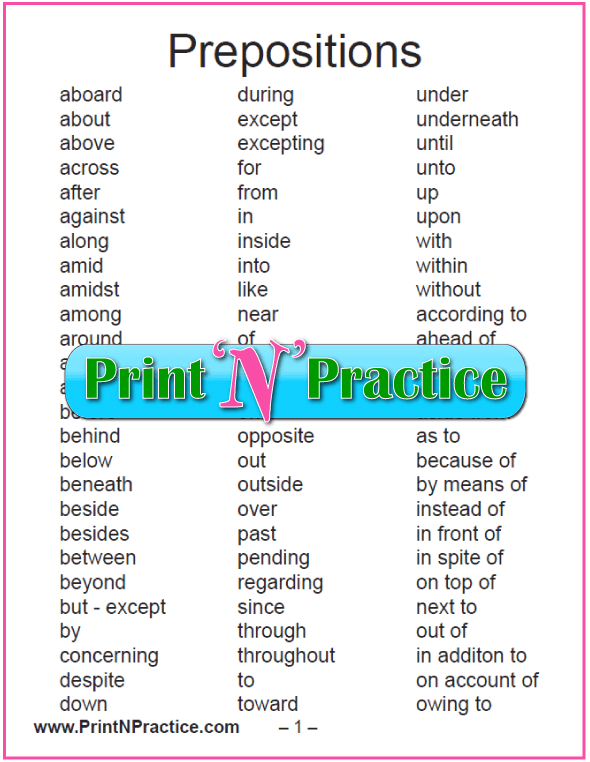 If your students will memorize the list of prepositions, they will be able to recognize prepositional phrases much more easily. Outside memorizing the list, using a preposition list on a chart is next best. Hint 2: Many times the preposition is followed by an article: a, an, the; or an adjective. Prepositions always point to an object which is why they are not to be at the end of sentences, clauses, or phrases. A preposition needs its object unless the object is understood substantively as with prepositions of place. 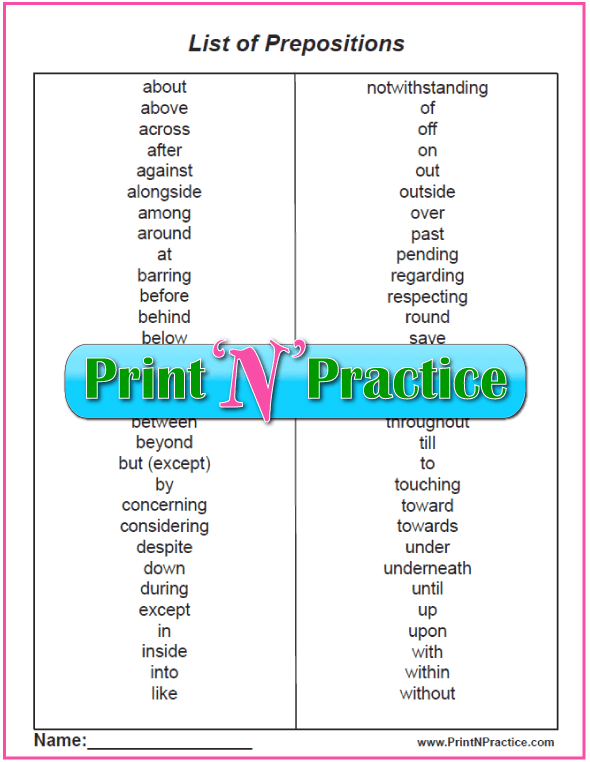 Using a list of prepositions can make both reading and writing easier. 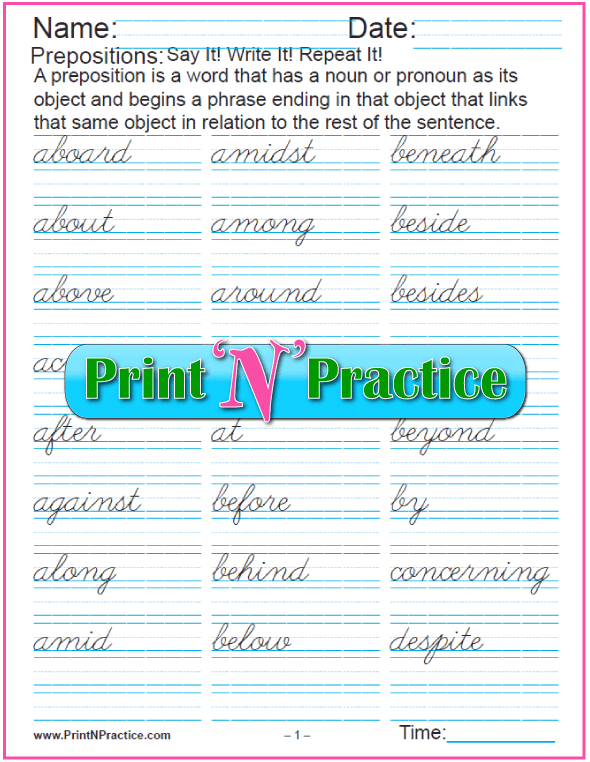 An alphabetical preposition list can be used as a writing prompt to improve writing. 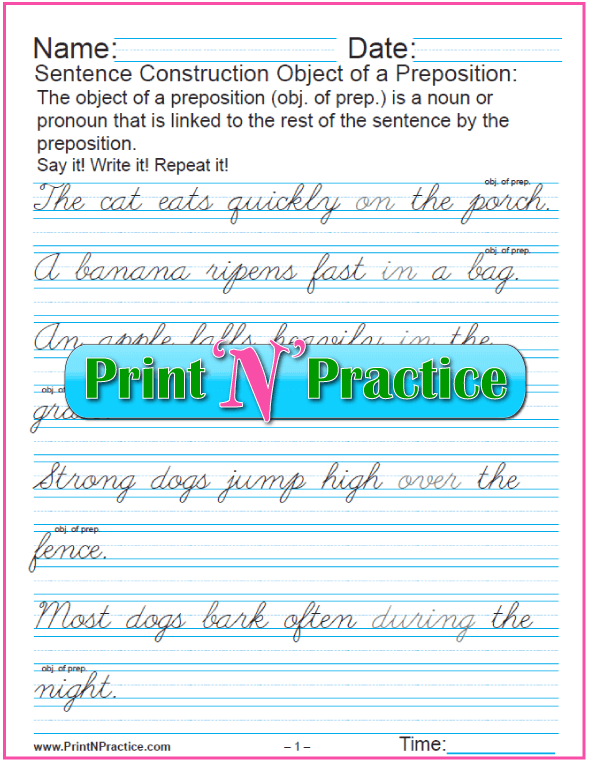 A list of prepositions can also help students discover prepositional phrases when they are learning to diagram. If they separate the phrases from the rest of the sentence it can be easier to name the other parts of speech. 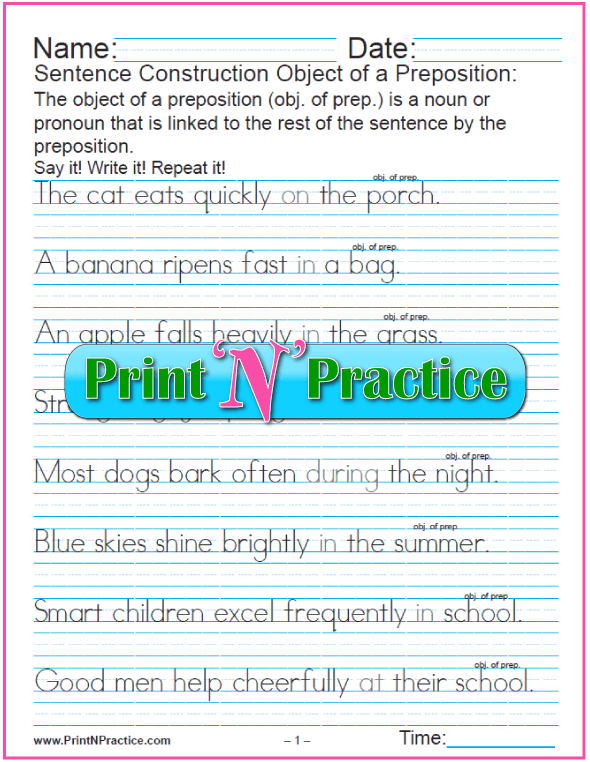 Kids can learn to recognize prepositions with this list of common prepositions. 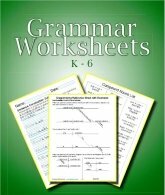 Memorizing the list can make grammar class easier. I like to print this list on card stock and keep it in a binder. The first set here has larger line spacing for younger students. The next includes a reference chart. The last is written in cursive writing. The prepositions in this sentence are printed in gray so that they are easy to see. 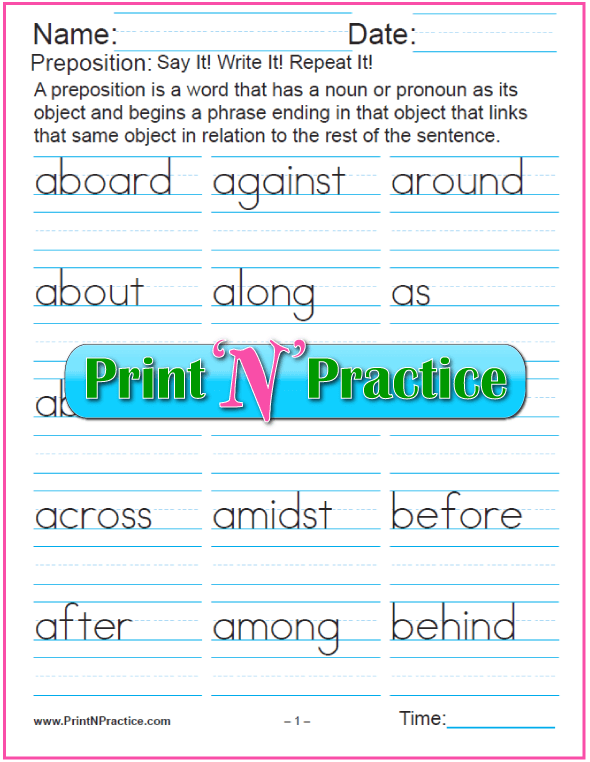 Have the children practice writing these sentences to see the real world way we use the list of prepositions. A preposition is a word that has a noun or pronoun as its object and begins a phrase ending in that object that links that same object in relation to the sentence. Object Of A Preposition - The object of a preposition is a noun or pronoun that is linked to the rest of the sentence by the preposition. The pencil is under the desk. Desk is the object of the word under. I'd not heard of compound prepositions until I'd seen them in one of our children's assignments. Personally, I think that the "compound" prepositions are sets of words (phrases?) that need to be edited. There are so many times when we could simply phrase our writing better. means "on the top of something", which makes it two prepositional phrases. I'd keep an eye for this, even though it is true that we often speak using what amounts to compound prepositions, writing gives us a chance to be more precise in our choice of words. It is especially helpful when we're free to use an editor or word processor and read our work out loud to be able to see that we are "missing something" in our writing - namely the preposition's object. 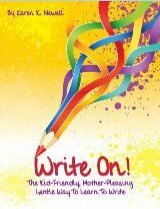 The better we choose our words, the better others will understand our writing. Normally prepositional phrases can add depth of detail to a sentence. The overuse of prepositions is as boring as a run-on sentence, but the descriptive use of prepositional phrases really enhances a story. 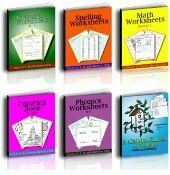 They can be used as adjective phrases describing the subjects and objects or as adverb phrases describing verbs. 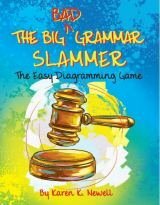 As a matter of fact, they were happy to learn that if a reading selection were too long or verbose, they could simply remove the prepositional phrases one at a time to make sense of the sentence and then add the phrases back to understand the details or instructions. If they could recognize the preposition, they could follow the articles and adjectives to the object of the preposition, mentally separate it from the sentence and see the main sentence much more easily. Also, prepositions help define instructional material. "Put it in the basket in the corner of the kitchen." The prepositions "in", "in", and "of" explain where to put it. Remove the prepositional phrases to see that "Put it" is the simple thought in this sentence. Learn about direct objects and indirect objects here.